In the early 1970’s, Detroit Michigan was the setting of a bloody and ongoing underworld war. The violence that resulted knew no bounds and claimed many lives. Amazingly, in the midst of the maelstrom stood two of the most unlikely generals one could imagine. Eddie Jackson and Courtney Brown lorded over a heroin ring that grossed millions of dollars while maintaining a virtually non-existent body count. This made them stand out from other heroin kingpins of the day, who by and large preferred gunplay to diplomacy. At a time when Black gangsters around the country began to firmly establish themselves in the dope game, Eddie “Fat Man” Jackson and Courtney “Field Marshal” Brown were playing from an entirely different playbook. In the world of street documentaries, the films of Al Profit occupy their own unique lane. Neither as amateurish as other such works nor as watered down as the more polished offerings from supposedly respected outlets, the films of Al Profit offer little known underworld history in a flashy but professional package. 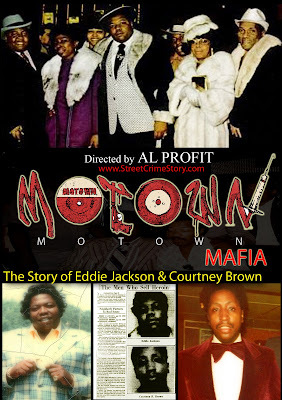 Like other works in his oeuvre, Motown Mafia: The Story of Eddie Jackson & Courtney Brown is a well-researched yet briskly paced rags to riches story from the Motor City. Visually, Motown Mafia is like a buffet. Al Profit uses black and white stock footage, brief reenactments, newspaper clippings, and exclusive photographs to tell the story. He makes smooth transitions between each medium, blending it all together into a sepia toned slide show. The audience is made to feel as though they are thumbing through a photo album with an old relative who provides a verbal caption for each picture. Al Profit’s voice over narration bridges the gaps between segments, making the film play more cohesively. As always with Al Profit, the soundtrack for Motown Mafia is populated with selections from various periods and subgenres of Black music. Scenes are underscored with rap music instrumentals (Westside Connection’s infamous “Gangstas Make the World Go Round” pops up frequently throughout. ), dusty blues, and classic soul. The contrast between eras and styles provides an interesting balance. The musical ambiance is true to period, yet it shows how the musical (and criminal) values of the early 1970’s still inform modern sensibilities. As expected, Motown Mafia is a joy to listen to. It’s like tuning in to an extraordinarily varied radio mix show. As with Rollin: The Decline of the Auto Industry and Rise of the Drug Economy in Detroit and Streets of New York: The Rise and Fall of Crime in New York since 1970, Motown Mafia offers a sturdy timeline of urban entropy. The prosperity of the Paradise Alley and Black Bottom neighborhoods is shown vividly. They served as hubs of culture and legitimate entrepreneurship. All of that came to a halt in the early 1960’s due to urban renewal. It’s important to note that Al Profit is perhaps the only maker of underworld documentaries that contrasts both the legal and illegal sides of Black entrepreneurship, depicting how the decline of one gives rise to the other. This makes Motown Mafia come off more like an actual historical document, and less like an episode of Gangland. Lasting a little over an hour, Motown Mafia compresses a considerable amount of information into a relatively short running time. Interviews and testimonials from various family members, associates, and employees are placed at appropriate intervals. Eddie Jackson’s fanatical enthusiasm for his father’s legacy is offset by the broken down demeanor of the old timers and veterans. All of it goes a long way in painting the desired picture of the fat man, though it would have been nice to hear from people who would’ve painted a more villainous portrait of him. Also, one wishes that some of the financial claims made throughout could have been better substantiated. However, Al Profit’s colorful presentation more than makes up for such minor nitpicks. Motown Mafia: The Story of Eddie Jackson and Courtney Brown is another compelling entry into Al Profit’s growing library of urban crime lore. It combines the exploitative flare of a supermarket tabloid with polish of a highly respected news outlet. Al strikes the sweet spot the so many of his contemporaries miss. I don’t know how many more of these he has planned, but if he maintains this level of quality, anyone seeking knowledge of Detroit’s darker history will have an amazing library to peruse.